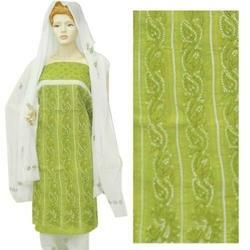 Our clients can avail premium quality of Cotton Embroidered Suits. These suits are acclaimed by customers for their colorfastness, smooth texture, eye-catching designs and patterns. Offered suits are highly appreciated by our valued clients for their beautiful embroidery and resistance against shrinkage. Red and golden color dhupion jacket with heavy zari and kundan work on jacket – Great collection of fancy suits, elegant embroidery work suits, designer suits, net suits heavy border suits in affordable price.